In the middle of the night on January 12 Our Lady in Her Częstochowa Icon arrived in the town of Teruel in Aragon, the capital of the region, after the journey full of adventure due to very bad weather. Strong wind was blowing, it was raining heavily and it was really cold. The Mother of God in Her “Life Mobil” assisted by police passed the central streats of the town and stopped at the Convent of St Clara Sisters which is situated at the very centre of the town. The sisters welcomed the Icon of the Mother of God with their tender hospitality and prayed continously in Her presence. 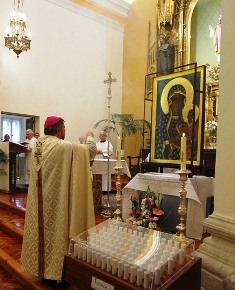 On the Feast of the Baptism of Our Lord, on Sunday, January 13, Bishop Carlos Escribano, the metropolitan bishop of Teruel and Albvarracin presided over the procession leading the Icon into the Cathedral as well as over the Holy Eucharist in the old cathedral of Santa Maria (Holy Mary), in the old part of the town in Plaza Mayor. The Cathedral was full of people. The celebrations were attended by around 700 people. In the afternoon the leaders of the local pro-life movement led the Holy Rosary in the intention of the defence of life and family. All multi-generation families came – grand-parents, fathers and mothers, and children. The atmosphere was full of joy and family feelings. Also the local families of Polish origin attended the event. 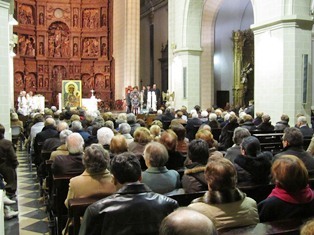 The visit of the Mother of God in Teruel was organised by the Department of Family of the Diocese of Teruel and Albarracin. All people present agreed that the Mother of God peregrinating across the world from “Ocean to Ocean” in defence of life brought a lot of joy to their hearts and to their families. Late in the evening on the 13th of January at 9.30 AM Our Lady of Częstochowa arrived in Castellon de la Plana. She was awaited at the Parish of Our Lady of Mt Carmel, the patroness of sailors. All the priests from the parish came to welcome the Mother of God. In the church around 150 people were waiting. They were mostly young families. They said the Holy Rosary in the defence of life and family. To honour the Mother of God a group of young people with guitars sang the Spanish version of the Polish hymn The Black Madonna, which is known around the world.